2. 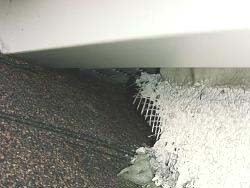 An adhesive and/or mechanical attachment of the insulation board to a substrate. 3. Glass fiber reinforcing mesh. 4. Basecoat on the face of the insulation board. 5. A textured protective finish coat. A drainage system is an exterior insulation and finish system with the above elements combined with a means by which water, that has entered the assembly, is allowed to exit the wall cavity. The typical barrier type EIFS installation includes the substrate, polystyrene foam board fastened or glued to the substrate, fiberglass reinforcement mesh, base coat (usually 1/16 to 1/4 inches thick and then a finish coast. (see illustration to the left). There are also systems using ExsulationTM and Polyisocyanurate Foam, both of which we have field experience with. 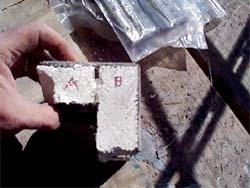 The American Society for Testing Materials (ASTM) defines Stucco as "a portland cement-aggregate plaster mix designed for use on exterior surfaces". ASTM further defines portland cement plaster as "a plaster mix in which portland cement or combinations of portland and masonry cements or portland cement and lime are the principal cementitious materials mixed with aggregate". "Traditional" or "three coat" stucco consist of three coats, the scratch and brown coats, normally referred to as the "basecoat plaster" and the finish coat. The final thickness, according to ASTM, is 7/8". So what then is "One Coat Stucco"? One Coat Stucco combines the "scratch and brown" coats into a single application plus a finish coat. The final thickness normally does not exceed 1/2". Stucco or One Coat Stucco is not to be confused with Exterior Insulation and Finish Systems (EIFS) or Synthetic Stucco, as EIFS has become to be known in certain areas of the country. EIFS have the appearance of stucco. 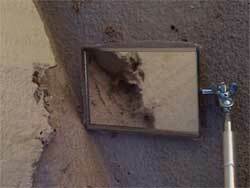 Stucco is a "natural" product, while EIFS are/is a synthetic product. Unlike stucco, EIFS can be applied to large areas uninterrupted by control joints, and with a wide variety of shapes, colors and textures. EIFS first was imported to the United States in the late '60's. Lately there has been a lot of excitement over this system and its purported failure as a siding system. There have been many reasons given for this failure, but almost every one can be traced back to faulty installation. Stucco walls sometimes have EIFS flourishes upon them. The stucco is the main exterior wall material, while the "sculpted shapes" on such walls are made from EIFS. This type of wall is not an EIFS wall. EIFS is a building material, not a whole wall, and does not include windows, flashings, sealants and other adjacent wall materials. Both systems have their advantages and disadvantages. 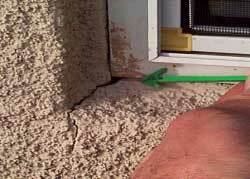 However, it is the EIFS that has experienced the most problems. Stucco on the other hand is plaster portland cement. The Stucco assembly usually includes a substrate over the framing members (there is a 'open framing' system) with a moisture barrier present, self furring lath, plaster cement basecoat and finally the hard coat finish. system at the base of the wall. 2. Failure to properly terminate the system at penetrations, such as windows, doors etc., resulting in cracks/water intrusion entry points. 3. Failure to properly terminate the system at roof / wall interface. 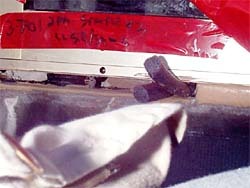 shims and install the backer-rod. © 2019 Robert J. Mault, Certified E.I.F.S. Inspector. All rights reserved.